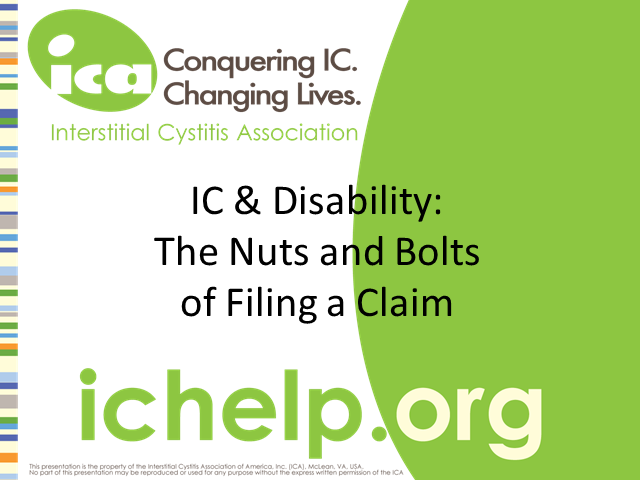 This webinar will focus on the practical aspects of filing an IC disability claim by highlighting advice from a doctor, patient and disability claim expert. A must see for any patient considering filing for disability. Join us on April 16, 2015 @ 7:00PM (EST) for Creating a Positive Patient-Provider Relationship, led by ICA Board member, Joy Selak, PhD, and her healthcare provider, Steven S. Overman, MD, MPH. Drs. Selak and Overman together wrote a book, You Don’t LOOK Sick! : Living Well with Invisible Chronic Illness, about their shared experience. This webinar will focus on how to find effective, supportive care and creating a positive patient-provider relationship. A must-see for anyone frustrated with standard IC treatments. The ICA does not engage in the practice of medicine. It is not a medical authority nor does it claim to have medical knowledge. In all cases, the ICA recommends that you consult your own physician regarding any course of treatment or medication. Comments presented are based on professional advice, published experience, and expert opinion, but do not represent therapeutic recommendation or prescription. For specific information and advice, please consult your personal healthcare provider. And products or medications referred to by brand name in Forum presentations are for recognition purposes only and do not imply or constitute an endorsement by the Interstitial Cystitis Association. Learn about the anti-inflammatory properties of omega 3 fatty acids and their role in mitigating IC pain. Why opioids may and may not be effective in managing IC pain. This session is supported by the Dan Brookoff Memorial Pain Management Fund. A proven stretching and strengthening program for relieving pain. What is CAPPS? … short for Complex Abdominal -Pelvic Pain Syndrome, CAPPS is a syndrome of nonmalignant origin consisting of a complex of abdominal and pelvic symptoms that includes a variety of painful bowel, bladder, genital, reproductive, muscular and nerve dysfunctions lasting at least 3-6 months in duration. Interstitial Cystitis/Painful Bladder Syndrome (IC/PBS) patients often have overlapping chronic conditions, including fibromyalgia, irritable bowel syndrome, vulvodynia, endometriosis, pudendal neuralgia, pain with sexual intimacy, pelvic floor dysfunction, obstructing adhesions, lichen sclerosis, and even TMJ, as well as psycho-social issues that often develop as a result of these difficult conditions. Attempting to treat these disorders as separate entities is often a frustrating task for patients and practitioners alike. Although these conditions may start out separately, they may be better diagnosed, assessed and treated as essentially connected disorders of pain processing in the pelvic region — CAPPS. In this webinar, Robert J. Echenberg, MD, FACOG, will discuss not only IC/PBS’s role in CAPPS, but also the multi-disciplinary and holistic approach that is needed in order to most effectively treat what most practitioners call “chronic pelvic pain (CPP). He will explain how IC/PBS should be considered as a “major player” in the broader context of “connecting the dots” in this family of all too common and debilitating conditions. This ICA webinar is made possible with the generous support of Innovation Compounding. Interstitial Cystitis (IC) is recurring pelvic pain, pressure, or discomfort in the bladder and pelvic region, often associated with urinary frequency (needing to go often) and urgency (feeling a strong need to go). The Interstitial Cystitis Association (ICA) is the only non-profit health association dedicated to improving the quality of healthcare and lives of people living with IC. The ICA provides advocacy, research funding, and education to ensure early diagnosis and optimal care with dignity for people affected by IC.